Eloquence takes many forms—poetic descriptions of nature, deep philosophical ruminations about life, clear-eyed explanations of complex situations. But sometimes eloquence can be very brief, a flash of insight, a simple blunt statement. Churchill's "Never give up." The Delphic oracle's: "Know thyself." It was that last variety that struck me Sunday during a Twitter conversation with my old pal, Phil Rosenthal, for years at the Sun-Times, now ensconced at the Tribune. I had posted an ode to Tastykakes prepackaged pies, noting the Philadelphia treat is impossible to find in Chicago, and Phil felt he had seen them at a certain Philly-based fast food joint. During the discussion that followed, he tweeted a single, three word sentence, almost as a non-sequitur: "I want pie." A straightforward expression. Yet it bowled me over, coming as a revelation, almost an epiphany. I read it and immediately thought: "My God! Yes, he's right. I want pie too. I've always wanted pie. That's all any of us ever want. Pie." You don't know this as a child, when your addiction to chocolate and sweets makes you prefer cake. And there is something dense and rich and devastatingly wonderful about a thick slice of deep, dark chocolate cake—think of the kind of cakes they lovely craft at House of Fine Chocolates, on Broadway in East Lake View. For several years after we moved from the city, we'd return to House of Fine Chocolates, to pick up birthday cakes—with the raspberry filling, natch. And it was a sign of bonds breaking when we stopped making the trek. My tastes had shifted anyway. I had set aside sweetness, with childish things, and gone for the more complex intermingling of a good pie—the tartness of fruit filling, the solidity of crust, so much more substantial than mere cake. And the glory of that tip, so perfect. In recent years, we're even done away with the cliche of birthday cake. My wife has been baking birthday pies, such as the sour cherry example above — to me, sour cherry is the ne plus ultra of pies, though I had a wonderful blueberry pie on our visit out East, baked by a Berea friend who knows of my affection for blueberry pie, the blueberries both substantial and evanescent, dissolving at the touch of a fork, simultaneously there and not there, like some Quantum mechanics riddle. There is another connection between particle physics and pie. Working on two stories in recent years I just completely dropped the ball, as a writer, and for the same reason. One was when I spent the day at Fermilab, talking to physicists about this Top Higgs Boson they were seeking. At the end of the day, I realized I was still completely in the dark—I still had no idea what they were doing, no idea what this mysterious thing they were looking for might be. I never wrote anything about the Higgs. I had been overwhelmed. And the second was spending a few hours watching Paula Haney make dough at Hoosier Mama Pie Company on West Chicago Avenue. There, I roughly understood what was happening -- she was baking these really good pies, in a bakery so dedicated to pies that it only sold pies, both sweet and savory, luncheon pies. She knew the secret to great pie is great crust, and had this complex philosophy of crust-making, which she explained to me and I understood, sort of. And I left filled with ambition, a front page Food section pie story, pitting Haney's vision of crust versus other crust masters, Sarah Stegner at Prairie Grass, and Gale Gand at Tru, and such. The vista of my grand pie story lay before me and glittered, the definitive crust expose, blowing the lid off the entire Chicago situation, pie-wise. Then I was swept away into my daily duties and the vision was lost. I never wrote anything about Hoosier Mama. Wracked with guilt, I pointed a young couple I knew who were doing these lovely on-line kitchen tours for WBEZ toward Hoosier Mama, and they at least gave Paula some publicity, so I didn't feel quite so bad. I try not to think about it. Try not to think about pie. As much as I love pie, I force myself to wait for pie to come to me, for the birthday to roll around, or to blunder into a restaurant that happens to offer really good pie. Because once I start looking for it; once I activate the "seek pie" circuit in my brain, it would be all I'd ever do. My eyes would slide open in the morning, and I'd think, "I want pie"—the imperative so eloquently expressed by Phil Rosenthal. So I have to block the concept of pie out, most times. this present post notwithstanding, and focus on whatever mundane, non-pie task is in front of me, and demand my brain be distracted by lesser thoughts, thoughts that aren't of pie. That's the grown-up way, I suppose. I'd hate to have too much pie. As if such a thing were possible. Click here to listen to Paula Haney talk about the lure of pie. 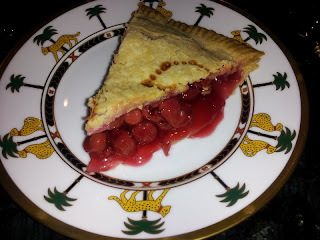 "to me, sour cherry is the ne plus ultra of pies"
I regret to inform you, Neil, that the last time I was over in the vicinity of House of Fine Chocolates, it appeared that it is out of business. I know that Wildfire is a chain - and some may turn their noses up to such places, but you must try their banana/coconut crème pie. Holy cow! was that a fabulous pie. No pie can beat cannoli cake. But strawberry rhubarb flavor is a good pie. Now you are going to make me go off my diet. Perhaps one of those mini round ones from the store bakery will be okay.